Many of us enjoy collecting things we value. They may be stamps, comic books, sea shells, or fabulous shoes. The list goes on and on. But have you considered URLs collectible? Having a thorough collection of links can be a great way to add value to your portal’s usability. With Liferay’s Bookmarks application, users collect and manage URLs in the portal. They can add, edit, delete, export and import bookmarks. Users can use links to access regularly visited web sites. Administrators can publish links tailored to specific groups of users. Both internal pages as well as external sites can be bookmarked. You can store all your important links in one place and you can manage this data easily using folders. You can create, edit, and delete bookmark folders. You get to decide how many bookmarks or folders are displayed on a page. Bookmark folders can have any number of subfolders. Here’s an example of what one bookmarks portlet might look like. Bookmark Folders are displayed above individual bookmarks. 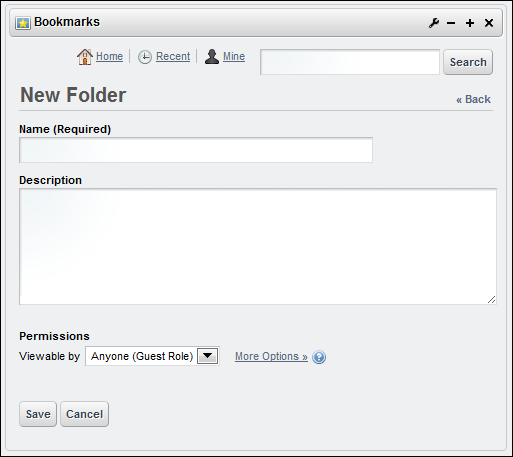 Figure 12.1: Individual bookmarks, not associated with a folder, are listed separately. In this example, there are eight bookmark folders, four of which have subfolders. The columns showing the number of folders and the number of entries show the subfolders and the entries contained within each top level folder. Note that total number of bookmarks includes those in the subfolders. Using the Actions button on the right, you can edit the folder, manage folder permissions, delete the folder, add a subfolder, or add a bookmark to the folder. As your collection of links grows, you may need to add more subfolders to keep things in order. Should you decide a link needs to move from one folder to another, you can manage this using the Edit option for that link. Just for fun, let’s move a link from the main bookmarks folder into a subfolder one level down. We’ll move the Liferay link into the Nonfiction subfolder in the Literature folder. The Nonfiction subfolder is a child of the Literature folder. We need to move the link to the Literature folder first before moving it into the Nonfiction subfolder. Figure 12.2: You can move a link one level at a time by selecting the Select button. To achieve this, we select Edit from the Actions button for the link. In the Edit view, find the section called Folder. When applicable, this section contains breadcrumb links to allow you to navigate freely among the other folder levels. Currently, there are two buttons here labeled Select and Remove. Click the Select button and a new window appears, like the one below. Clicking the Remove button here doesn’t affect the link. It is used solely for moving links out of folders and subfolders back into the main Bookmarks view. Figure 12.3: Select the Choose button next to the desired folder. Now choose the Literature folder. When you do this, notice how the link’s Folder section changes to reflect the new location of the link. Figure 12.4: When you choose a folder, the folder navigation changes to reflect the new location of the link. When you choose Save, you return to the Bookmarks portlet. Notice that the Liferay link is no longer under the Bookmarks section. Select Literature to reveal its contents. In the example below, you can see the Liferay link is now in the bookmarks section of the Literature folder. 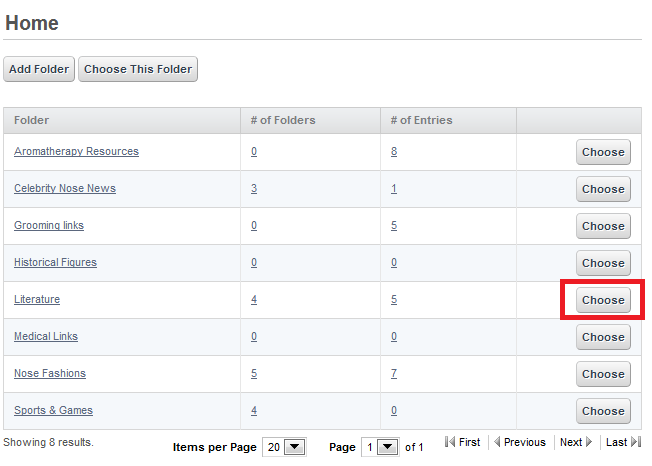 Figure 12.5: When you move a link to a folder, it remains in the bookmarks section until it’s moved into a subfolder. 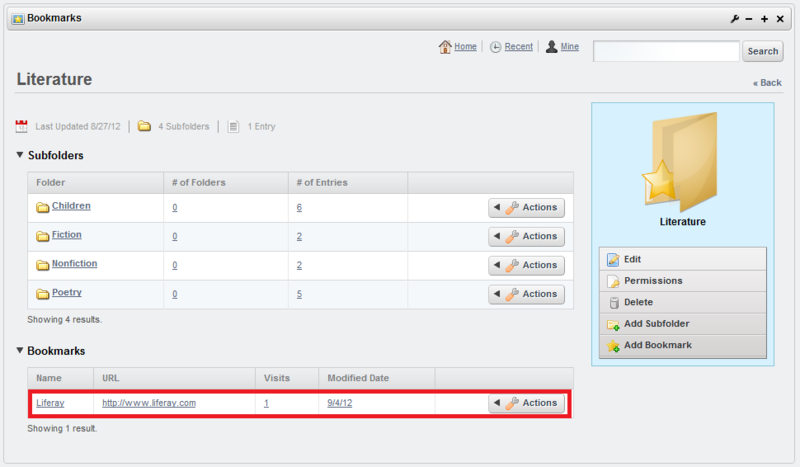 Select Edit from the Actions button next to the Liferay link, then click Select. Choose the Nonfiction subfolder and again notice the change in the folder-level breadcrumbs. Click Save and the Literature folder view appears. Select Nonfiction to see your link in the subfolder’s bookmarks list. Piece of cake, right? To move a link out of a subfolder and into a higher-level folder, Edit the link in the subfolder and choose Select. Figure 12.6: To move a link up to a higher-level folder, choose the appropriate folder from the breadcrumbs in the Select view. In the resulting window, select the appropriate folder from the breadcrumbs at the top. In this example, we selected Literature for consistency. This opens a new window, like the one below, showing the other folder options. Figure 12.7: In this view, you can move the link into several different locations. You can choose one of the other subfolders from the list, or you can choose Home from the breadcrumbs at the top. When you verify that the desired folder is the one currently displayed in the breadcrumbs, click Choose This Folder. Then click Save and you’re done. If you don’t like any of the subfolders listed, you can place the link into a new subfolder by using the Add Subfolder button. If you choose Remove instead of Select in the above example, you take the link out of both subfolders and return it to the main bookmarks view. Now that you have an understanding of how bookmark folders are used, let’s create some new bookmarks. 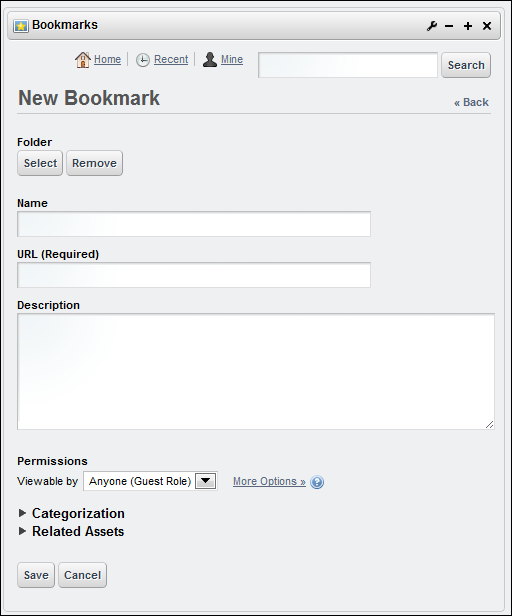 Figure 12.8: Initially, no bookmarks are listed in this form until they’re created. Across the top of the portlet are links labeled Home, Recent, and Mine. There is also a Search field and button. Home: returns you to the top level of the portlet. Recent: displays a list of the latest bookmarks that have been added. Mine: displays a list of the bookmarks you added to the portlet. Search: lets you search for bookmarks by name, category, or tags. When you select the Permissions button on the right, a list of Roles and their associated permissions appears. 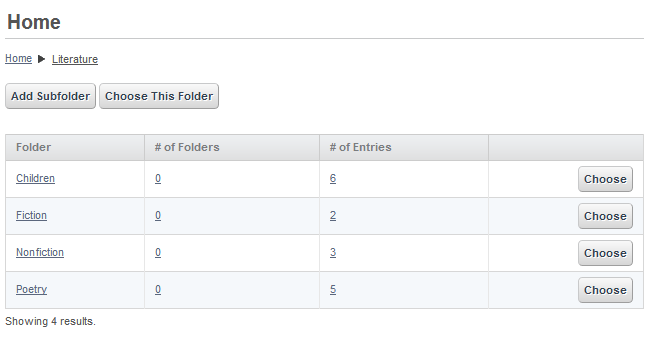 The options are Add Entry, Add Folder, Permissions, and View. When you are finished selecting the permissions click Save. 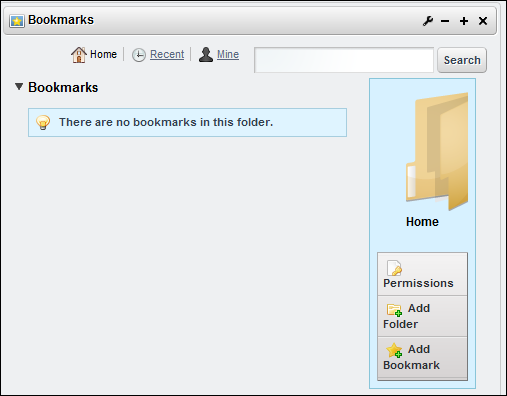 Figure 12.9: It’s not necessary to enter a description for a Bookmarks folder. 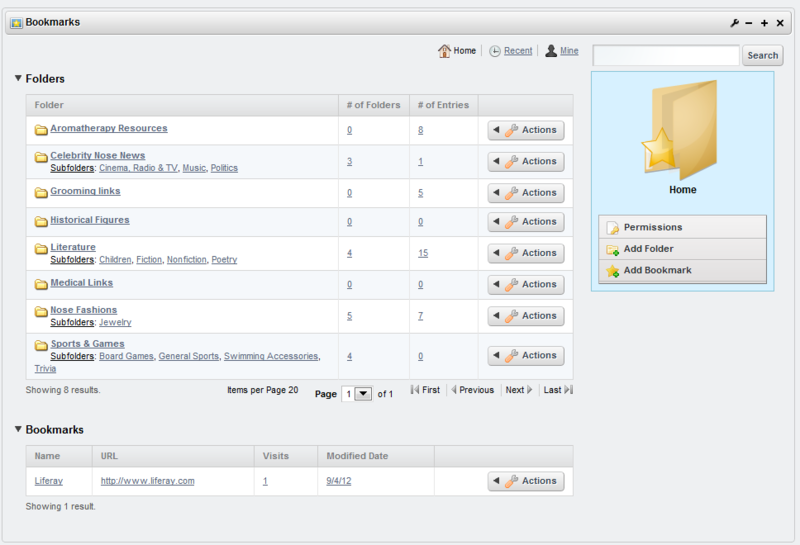 Here you can choose the folder’s name, a description of its contents, and who can view it. Under More Options, you can set portlet permissions for various Roles to the folder. Click Save when you are finished. To create a bookmark, click the Add Bookmark button. This form is similar to the New Folder form but has a few more options. Figure 12.10: When you use the Add Bookmark form, you must enter a valid URL in the required field. Click Select to choose the folder for the new bookmark. Click Remove to delete a bookmark from the selected folder. As stated above, a removed link goes into the list of general bookmarks that aren’t associated with a folder. These are listed in the bookmarks section, below the folders, in the portlet. Below the Permissions there are additional options for Categorization and Related Assets, just like in other Liferay applications. Please see chapter 5 on the Asset Framework for further information about this. Once you have added a new bookmark, it appears in the portlet. From here, you can manage your bookmark using familiar Liferay editing features. Collecting and organizing your links is a snap when you use Liferay’s Bookmarks application.